Solar in Chisago County: The 100MW North Star Solar installation in Chisago County is Minnesota’s largest, and produces enough electricity to power about 20,000 homes. Chisago County is also home to several community solar gardens and installations on area homes and businesses. This event, and The Power of Minnesota film, focused on telling the many stories of the people behind this enormous accomplishment. Michael Noble, Executive Director of Fresh Energy, kicked off the event with a talk about the country’s dramatic shift to a clean energy economy, and the role that Chisago County is playing. He spoke about the drastic price reductions in solar, wind, and battery storage that are making this swift transition possible, and the necessity of wringing all of the waste out of our economy by becoming as energy efficient as possible and then powering our lives with clean electricity—including transportation. The Power of Minnesota film was then screened at the event. It was created to highlight the benefits and successes of solar and wind power projects throughout the state, and to foster community engagement and awareness. The documentary features stories about the many ways in which clean energy is both driven by and supporting Chisago Lakes area landowners, officials, educators, and businesses. It is available to watch at https://powerofmn.com. “Our foray into solar energy, which began as a daydream of a bunch of 7th graders, is saving Chisago Lakes Schools between $3-6 million dollars over 30 years,” said Pat Collins, a 7th grade teacher at Chisago Lakes Middle School. “It takes a lot of fundraisers and bake sales to equal that amount. And the much bigger question is what are we really teaching our students? The solar panels on our school roofs teach our students to look ahead, to innovate, to think differently, to see beyond our time, and to be leaders rather than followers”. Chisago Lakes School District has five rooftop solar projects at the high, middle, and primary schools, as well as Taylors Falls and Lakeside elementary schools. They also have a community solar garden subscription. These solar panel systems not only save energy dollars but also provide science learning opportunities for students and help to meet the district’s sustainability goals. George McMahon, 2018 Chair of the Chisago County Board of Commissioners, talked about how Chisago County is receiving more than $250,000 per year in property tax relief because of solar power, and how the school districts in North Branch and Chisago Lakes are also benefiting from solar energy production tax revenue, amounting to several tens of thousands of dollars a year. The event ended with a screening of a new episode of the popular Prairie Sportsman program from Pioneer Public Television about how prairie is being planted under and around large solar arrays in Minnesota to create habitat for local wildlife and pollinators—a practice that’s taking off in Chisago County. After that several people stuck around for a full screening of The Power of Minnesota film. 10 organizations provided resource tables: Clean Energy Resource Teams, Chisago Lakes School District, Chisago County, Chisago Lakes Area Chamber, Center for Energy and Environment, Xcel Energy, IPS Solar, All Energy Solar, Minnesota Native Landscapes, and Fresh Energy. The celebrating continued at Chisago Lakes Grill at a gathering featuring Solar Sweet Farm Cider from Milk & Honey Ciders, made using honey from prairie plantings at Minnesota solar farms. Sad you missed it? You can watch The Power of Minnesota online at https://powerofmn.com, watch the full October 4th event when it replays on Chisago Lakes Cable Television Public Access Channel, and watch the new episode of Prairie Sportsman when it airs in January 2019. 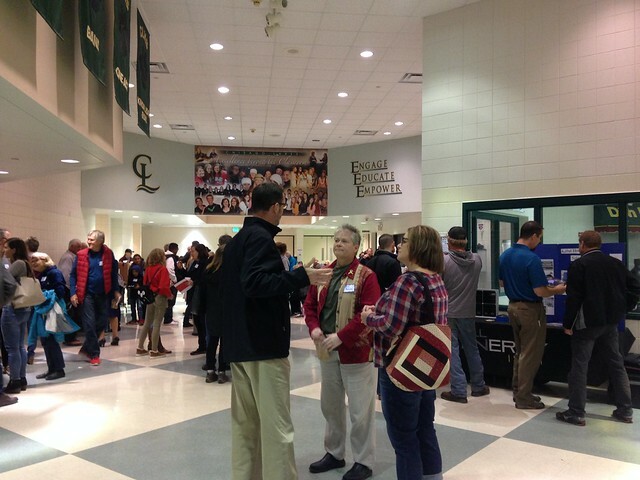 The event was co-hosted by: Chisago Lakes School District, Chisago County, Chisago Lakes Chamber & Information Center, Chisago Lakes Area Initiative, and the Clean Energy Resource Teams (CERTs).